By the sound of the name, I imagine that these New Years fritters were adopted from our Ukrainian roots. My own mother was not in the habit of making these, but the family I married into was, so I chose this recipe many years ago, submitted by a Mrs. J. H. Peters to the Mennonite Treasury of Recipes. The trick is to make sure that the oil is the right temperature, so it is good if you can use an electric pan or fryer where you can set it. This recipe makes 3 dozen. In a large mixing bowl, combine milk, water, salt, sugar, soda, raisins and prunes. Combine flour, baking powder and yeast, adding some to the liquids. Stir egg yolks into batter and then add the rest of the dry ingredients to make a heavy batter which will be rather stiff. Using two regular tablespoons (one for scooping and one for scraping) drop into hot oil (about 375° F or 190° C), turning over once and frying until brown. I also like to use a cast iron for deep frying. Pop in a few kernels of popcorn, once they pop, you know the oil is hot enough. Scoop into a paper towel lined pan and roll in sugar while still warm. Thanks for this recipe. I had already checked out last years. Off to my sister's tomorrow to teach her how to make these. Does anyone eat them at other times of the year or for special holidays? Actually, if you keep the oil at the right temperature, doughnuts/fritters don't absorb as much oil as the 'anti-fun food people' would have you believe. These look yummy, I might make them for the family supper tomorrow. These are the ONLY treat my hubby asks for at Christmas time, so this year I'll make them twice... I already made one batch before Christmas! They are great for sharing too. I use the recipe in the Greendale MB church cookbook (1st edition)and they are awesome. I had some Dutch neighbors bring me some "Olle-bollen" one year... it was similar, but theirs were much more saturated and greasy. I don't know about proper pronunciation, but my family says "PORT-zel-chuh" spelled just as it is in your title. Thanks for spreading the love of these yummy delights. This look wonderful! Thank you and Happy New Year to all of you special ladies that make every day fun! Have a Blessed, Healthy Happy New Year! They do look scrumptious! I really enjoy your blog. I sit down with my coffee in hand and check your blog every morning. Happy New Year to you ladies. I use the recipe from the Grace Mennonite cookbook. And to all a Happy New Year!! My mom made these evry year on New Year's Eve. We called them New Year's Kuchen. I'm giving it a try. I've added a little vanilla and lemon...we'll see how they turn out! Thanks for stirring up old happy memories. Oh, they look so real and so close, I can almost poke my finger through the computer monitor! ...they remind me of childhood and a warm, cozy home with family gathered in the kitchen New Year's Day morning, and the Rose Bowl Parade playing and the brown paper lunch bags filled with sugar we'd shake them up in.....The Good Ol' Days!...they look JUST LIKE I remember them. :) Thanks! Oh these bring back some really wonderful memories of how my Mennonite Grandma in Haney used to make these sometimes for New Years Eve so long ago. I'm a bit late commenting, but I just wanted to say that those doughnuts greatly resemble the Dutch treat olie bollen that were made in my family! Wherever they are from, they're good! Thanks for this recipe! I remember eating these with my Grandma at Aunt Ida's house in Saskatoon. Now I'm going to try making them with my daughter for an "ancestry" project at school. My Aunt Nettie left a batch of Portzelky at my Mom & Dad's for us to enjoy this Christmas. They were frozen then reheated in the oven and were absolutely yummy!! We often serve them plain with icing sugar to dip (or not) on the side. It would not be New Years without making these! I have made these every year except one in my 42 years of marriage. Our sons's new wife couldn't understand why we don't use a cinnamon/sugar mixture to roll them in--until she tried it. Didn't taste the same! Some things just can't be messed with. My mother-in-law made the best Portzelky and we have not had them since she died 14 years ago. In 2010 I discovered your recipes and was inspired to try this recipe today. Success! My husband cannot stop crowing about how good they are. Thank you, thank you. I made a delicious batch of these tonight for the first time. My kids loved them. I even brought some over to my Dutch neighbor who said were just like his wife used to make. A tip for getting your oil to the right temperature without a thermometer is to put a single kernel of popcorn in the oil at the start, when the oil reaches 350 the kernel comes to the surface and pops. Then you know you're ready. I made these this past New Year's Eve and brought them to our church party. My husband said they were the best fritters he'd ever had, and that's saying a lot because his mom is a fabulous Mennonite cook! They were scarfed down at church as well with many positive comments. So glad to have found the recipe. Mom came from Turkestan and Dad from South Russia. I always assumed the name had a Russian flare. I can make it this year with a good conscience knowing that if I fry it in coconut oil, not only will it taste fantastic, but it will also be healthy. Canola is horribly unhealthy though. I wouldn't recommend it. You'd be better off using the animal fats our great-grandparents used. But coconut oil is best. I grew up calling these Niejoaschkuake (NEE-ush-koh-kah). I wonder why we call them that while everyone else calls them Portzelky? We're going to make them for a Niejoaschkuake party this year. Well, if you speak low German, you know that Neijoaschkuake translates to New years cookies / fritters ...Portzelky is probably what the Russians or Ukrainians called them ... and certan Mennonites referred to them in their own language. Those are just my thoughts. I don't speak Russian. Yes, it does mean New Year's Cookies in Plattdeutsch, the low German spoken by the "Russian" Mennonites. They spoke this throughout their time in South Russia (which is now Ukraine). I understand the origins of this food to go all the way back to their Dutch roots, and not adopted during their time in Ukraine. I also understand the Dutch name to be Olliebollen, and although Portzelky sounds Slavic, according to Norma Jost Voth ("Mennonite Foods and Folkways from South Russia"), "Portsel" means "tumbling over" in low German -- as in the way the fritters tumble over in the oil when deep-frying. She spells the word thus: Portselkje. Whatever you call them, they still taste great. My large extended Mennonite family always made these at New Years. Then when I married into a Dutch family that had emigrated to Canada in the 1950s, my mother-in-law made them as well. Her recipe was almost the same, except they were a bit more tender & sweet. Both versions had raisins & currants in them. My mom always let us dip them in confectioners' sugar & my M-I-L just sifted the icing sugar over them before serving. 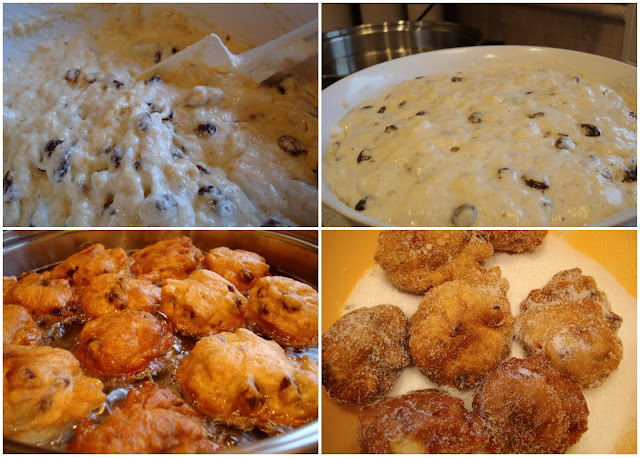 I also grew up in a Mennonite family and we had these fritters and called them New Year's Cookies or portzelkje. Last night I went to a new year's eve party and saw raisin and apple fritters, and thought, who is the Mennonite here? Turns out it was a woman from the Netherlands. They called it something different, that translates to "oil balls." They tasted the same as mine, except that they really shouldn't be made in advance like that because they are not nearly as good when not fresh out of the oil and still warm! I made them January 3rd/2016 and devoured many while frying them. I had not made them for several years. Why, I'll never know because they are so...........good. One reason I hesitate to make them is the smell of deep-frying which lingers in the house. tonight, I am eating them with my children which adds to the pleasure. What I don't understand is, why use yeast, baking powder and baking soda. I am of German heritage but we only use yeast. It seems overdone to use all three, yeast, powder and soda. Doris, I really have no idea why several kinds of leavening are used, but I think it may have something to do with texture. I have made them this way, but I think you'd be fine with just yeast. Eck sach den Shornsteen Roacke. Eck visst voll vaut ye moacke. Yave ye me eane - Dann bliev eck stoane. Yave ye me twea - Dann fang eck aun to goane. Donn vensch eck you daut gaunse Himmelrick. I saw your chimney smoking. I knew what you were making. You were baking New Year's Cookies. Give me one - I stand still. Give me two - I start walking. Oh, that is funny! I've never heart that but I understand most of the Low German - the translation helps because it is unusual to see Low German in written form. How to know they are done? Only fill the pan so that they have room to freely float - then check, from that first frying batch. Break one open to make sure there is no dough. Lower heat or make them smaller if they are not cooked through by the time they are browned on both sides. While I used to enjoy New Year's Cookies at holiday time during my youth, I now enjoy them every April at the MCC sale in Fresno, CA. The line for the 'fritter' booth is as long as all the others put together, and some folks will wait for hours to get their dozen. So fresh they burn your fingers if you try to eat them too soon (but you can't help it)! I'm inspired to find my recipe and make a batch this year. You suggested that these come from our Ukrainian roots. My Dutch friend calls them 'oliebollen' and says that they are a Dutch new year tradition and makes them every new year. Makes me think that they go back further than Ukraine with the Mennonites. You are right, Helene, it sounds like the tradition goes further back. However the name change (if tht is what it is) is due to the place they lived in. I think they may have adapted to a version that was made there. Coming as an immigrant myself, I have seen how German speaking people have made English words part of their vocabulary. After several generatins of that, it definitely becomes part of the language. Thank you for your thoughts. I love how traditions take you back to your roots.